When I first became a vegan, I had no idea what to eat for breakfast especially if I was craving something savory. This led me to eating avocado toast. I’m talking endless amounts of avocado toast for days on end. Don’t get me wrong, I love avocado toast. 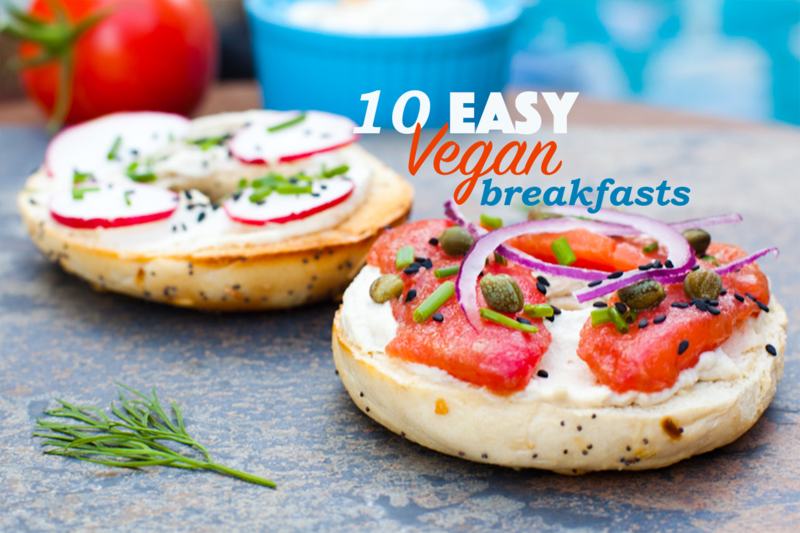 On sprouted grain bread, it’s a healthy, delicious, high-protein vegan breakfast option. But I overdid it for sure. After a few months, I could barely look at a piece of avocado toast. So if you’re new to being vegan, or simply looking for more delectable plant-based breakfast options, here’s a list of my top 10 vegan breakfast recipes. I’ve included everything from savory to sweet, smoothies to pancakes, and everything in between. Enjoy! This tofu hash scramble is a staple of any vegan breakfast menu. It’s hearty, savory, and oh so tasty! Marinated tomatoes take the place of lox in this classic NY style breakfast. Delish! You can’t have a vegan brunch menu without a breakfast burrito! Hearty, savory, and full of flavor, this recipe is a crowd pleaser for sure! Sweetened condensed coconut milk and freeze dried strawberries make this vegan french toast taste like an incredible pastry version of your favorite childhood cereal. It is SO GOOD! Have dessert for breakfast with this healthy vegan chocolate shake. It’s full of protein, fiber, and tons of chocolatey goodness. Ready in less than five minutes! You won’t miss the eggs in this classic brunch dish. It’s healthy, full of protein, and tastes remarkably close to the real thing. This one is a must try! This unbelievable vegan breakfast dish whips up quickly the night before for an easy bake in the morning. Sweetened condensed coconut milk with vegan cream cheese make french toast bake delightfully indulgent. I had to include at least one smoothie on my list of favorite vegan breakfast items. This one is a keeper. It’s packed full of anti-oxidants, fiber, protein, and healthy whole grains. 10. Buttermilk Cornbread Pancakes Last but certainly not least, we have vegan pancakes! These are a Southern take on the classic breakfast dish. The cornmeal gives them the perfect amount of crunch and the blackberry syrup compliments the flavors perfectly. Two thumbs up! If you try any of these easy vegan breakfast recipes, be sure to rate them in the comments and tag a photo #carrotsandflowers on Instagram! Cheers, friends!